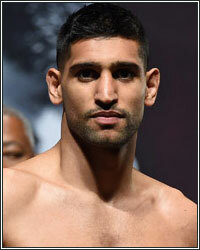 According to multiple reports, former world champion Amir Khan has received a $5 million offer from Top Rank to face undefeated multi-division world champion Terence Crawford. The bout would take place on March 23 at Madison Square Garden and would be televised on pay-per-view by ESPN. Khan himself has confirmed the reports. "Fighting for a pound-for-pound title would be amazing. To win it would be even better, so I think I'm in a position where I can get that fight with the pound-for-pound champion at the moment. The Brook fight is always going to be there. It's for no title, whereas I'm getting offered a world title and the pound-for-pound title. So why not," Khan said in an interview with Daily Mail. In another interview with the Daily Express, Khan added, "There are other fights out there at the moment, like pound-for-pound champions, that is on the table for me. And I think that’s a fight which might never, ever come in my lifetime again. The pound-for-pound title is back in the welterweight division It’s Crawford. Crawford has the pound-for-pound title and I’ve got that fight right in front of me, so I want to take that one. It’s either that or the Kell Brook fight."